Pennsylvania Drug Card recently toured the Geisinger Janet Weis Children’s Hospital. At that time, a check was presented in the amount of $10,047.45. These dollars are necessary to fund the child life programs which make it possible for children to experience the joys of childhood while in the hospital. In 2016, Geisinger had more than 430,000 pediatric patient visits. A donation is made to the local CMN hospital each time a prescription is processed through Pennsylvania Drug Card. 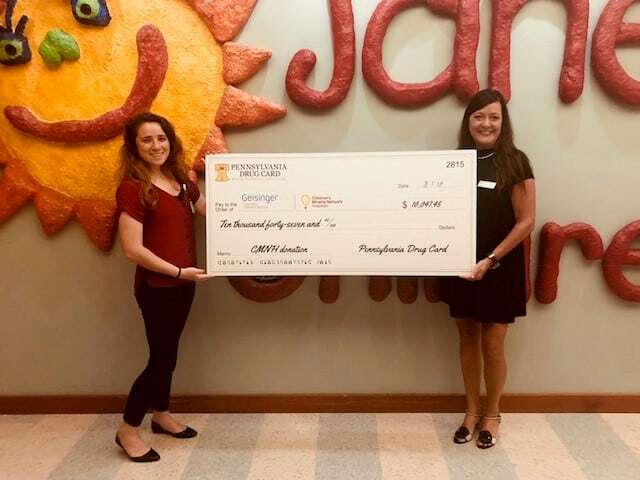 Pictured: Samantha Kennelly, Coordinator, Children’s Miracle Network and Heidi Barousse, Program Director, Pennsylvania Drug Card. Since 2015, the United Networks of America partnership with Children’s Miracle Network Hospitals has raised over $2.4 million dollars for local children’s hospitals. Of this, $10,047.45 has been raised for Geisinger Janet Weis Children’s Hospital.